January 2 The Songs of Distant Earth - Part 2 A discussion of the story behind Arthur C. Clarke's "The Songs of Distant Earth" and how Mike Oldfield composed music based on it. January 9 Mythodea - Part 1 An exploration of the space music of Vangelis and his composition of music for the 2001 Mars Odyssey spacecraft. January 16 Mythodea - Part 2 An exploration of the space music of Vangelis and his composition of music for the 2001 Mars Odyssey spacecraft. January 30 Disco Ball In Space A description of the Starshine 3 satellite. Courtesy of NASA. February 6 Earth Songs An exploration of the natural radio signals of our planet, including those generated during an exceptional electrical storm in Melbourne. February 6 Starshine 2 A description of the Starshine 2 satellite. Courtesy of NASA. February 13 ET's Breath The search for the chemicals of life in the atmospheres of extrasolar planets. Courtesy of NASA. February 20 Galaxy Collissions How galaxies are colliding in Stephan's Quintet. Courtesy of the Space Telescope Science Institute. February 20 Where Lightning Strikes New maps of global lightning patterns based on satellite sensor data. Courtesy of NASA. February 27 Tour of the Orion Nebula A description of the star forming area of the Orion Nebula. Courtesy of the Space Telescope Science Institute. March 6 Service Call to the Hubble by STS 109 - Part 1 Description of the mission of STS 109 to upgrade the Hubble Space Telescope. Covered the launch, capture of Hubble and the first two spacewalks. March 13 Service Call to the Hubble by STS 109 - Part 2 Description of the mission of STS 109 to upgrade the Hubble Space Telescope. Covered the last two spacewalks, press conferences, and the undocking and landing. Also crew interviews. March 13 GRACE Description of the GRACE satellites to map the Earth's gravity field. Courtesy NASA. March 20 The Sun Does A Flip How the Sun's magnetic field is reversing as part of its 22 year cycle. Courtesy NASA. March 20 First results From Chandra Discussion of the initial findings by the Chandra Xray Observatory. Courtesy Space Telescope Institute. March 20 Asteroids Discussion of near-Earth asteroids. March 27 Dark Energy How distant supernovae lend insight into dark energy and the inflation of the Universe. Courtesy of NASA. April 3 Antibiotics In Space Why microbes yield more antibiotics in space. Courtesy of NASA. April 10 Installing the S-Zero - Part 1 The STS 110 mission to install a major element on the International Space Station. Covered preflight activities and the launch. April 10 The Muana Kea Telescopes A description of the observatory atop Muana Kea in Hawaii. Courtesy National Public Radio. April 17 Installing the S-Zero - Part 2 The STS 110 mission to install a major element on the International Space Station. Covered in-flight press conferences, docking of Atlantis to ISS and first two spacewalks. April 17 FUSE The Far Ultraviolet Spectroscopic Explorer satellite. Courtesy National Public Radio. April 17 Achievements of the Hubble Space Telescope What the Hubble Space Telescope has achieved since its launch. Courtesy National Public Radio. April 17 Dizziness In Space Why astronauts returning from space sometimes feel dizzy. Courtesy NASA. April 24 Origins of Gold A theory for the origin of gold in colliding neutron stars. Courtesy National Public Radio. May 8 Kuiper Belt Twins The discovery of the Kuiper Belt of icy bodies beyond the orbit of Neptune, and the finding that 1998 WW31 is a binary with highly eccentric orbits. May 8 Rockin' In The Orbit A exploration of how the popular music of the late 1950's was affected by the telemetry sounds of the first satellites. May 8 Life Aboard the International Space Station Astonaut Stephen Smith's responses to e-mailed questions about life aboard the International Space Station and the Shuttle. May 15 Astronomy and Astrophysics Update The discovery of terrestrial type extrasolar planets and are the constants of physics not so constant after all? Courtesy National Public Radio. May 22 Telebridge Conversation with ISS Crew Primary school students at Bordertown, South Australia, talk with astronauts aboard the International Space Station via ham radio relayed via South Africa. Courtesy community radio station 5TCB. May 22 Transparent Sun How the SOHO satellite is enabling us to see sunspots on the other side of the Sun. Courtesy NASA. May 22 Slowing Light How physicists have been able to slow light. Courtesy National Public Radio. May 29 Ask The Crew Of ISS Responses of the crew of the International Space Station to questions from the public. Courtesy NASA. May 29 Water on Mars New evidence for water on Mars. Courtesy NASA. May 29 Europa A summary of new findings by the Galileo spacecraft about Jupiter's moon Europa. May 29 Can Deserts Be Cold? Emma Foster, Uditha Lilani and Whitney Cheung of The Mac.Robertson Girls' High School with their winning entry in the Earth & Sky Young Producers Contest. June 5 Solar Flares A descrition of the HESSI satellite and its mission to study solar flares in hard xrays and gamma rays. Courtesy NASA. June 19 STS 111 - Part One The flight of the Endeavour to the International Space Station. June 26 Mythodea - Part 1 An exploration of the space music of Vangelis and his composition of music for the 2001 Mars Odyssey spacecraft. July 3 New Extrasolar Planets A description of the discovery of new extrasolar planets, and how they are thought to have formed. July 10 Mythodea - Part 2 An exploration of the space music of Vangelis and his composition of music for the 2001 Mars Odyssey spacecraft. July 10 STS 111 - Part Two The flight of the Endeavour to the International Space Station. July 17 Floating Fertility Sperm in zero gravity. Courtesy NASA. July 24 Apollo 17 A look at the last Apollo moonlanding and the geological exploration of Harrison Schmitt. July 31 Meteorites and Asteroids Discovery of sugar in the chemical spectrum of metorites, and the chances an asteroid might strike the Earth. Courtesy NASA. July 31 Brightest Star Found Hubble Space Telescope find the brightest star in the Milky Way. Courtesy National Public Radio. August 7 Visible Asteroid Description of how an astroid will pass so close to the Earth it will be visble from the Northern Hemisphere. Courtesy NASA. August 21 Voyager 1 and 2 25th Anniversary - Part One An examination of the achievements of the Voyager 1 and 2 missions. Included music carried on the Voyager Interstellar disc, and music inspired by the Voyager plasma wave recordings. Also, Ed Stone's reflections on the Voyager mission. August 28 Voyager 1 and 2 25th Anniversary - Part Two An examination of the achievements of the Voyager 1 and 2 missions. Included music carried on the Voyager Interstellar disc, and music inspired by the Voyager plasma wave recordings. Also, Ed Stone's reflections on the Voyager mission. August 28 Bose-Einstein Condensates and Neutron Stars The making of Bose-Einstein condensates has given a new insight into neutron stars. Courtesy NASA. August 28 Near Earth Objects A look at objects which come near to the Earth. Included the music of Fiorella Terenzi. August 28 New Theory of Origin of Universe Paul Steinhart's new theory for the origin of the universe. Courtesy National Public Radio. September 4 Voyager 1 and 2 25th Anniversary - Part Three An examination of the achievements of the Voyager 1 and 2 missions. Included music carried on the Voyager Interstellar disc, and music inspired by the Voyager plasma wave recordings. Also, Ed Stone's reflections on the Voyager mission. September 4 Bone Loss in Space How spaceflight affects our bones. Courtesy NASA. September 11 Voyager 1 and 2 25th Anniversary - Part Four An examination of the achievements of the Voyager 1 and 2 missions. Included music carried on the Voyager Interstellar disc, and music inspired by the Voyager plasma wave recordings. Also, Ed Stone's reflections on the Voyager mission. September 18 Amateur Radio Contact with International Space Station Students from the Glen Waverley Secondary College in Melbourne talk with astronaut Peggy Whitson aboard the International Space Station via an amateur radio link set up by members of the Mountain Districts and Eastern Radio Club. Included preliminary comments by teacher Alan Payne and follow-up comments by radio club members. 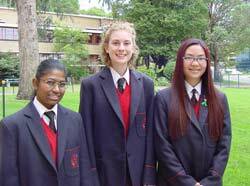 Also interviews with students Lucy, Claudia, Alicia and Sharma. NOTE: The broadcast was not recorded. We offer here the elements used. October 2 Clouds and the Greenhouse Effect New satellite findings on effects of clouds on the greenhouse effect and climate change. Courtesy of NASA. October 9 The STS-112 Delivers the S-One Truss to the International Space Station - Part One An overview of the planned mission and coverage of the launch and first mission day. October 9 Binary Black Holes How the Space Interferometry Mission will seek galaxies with dual black holes. October 16 The STS-112 Delivers the S-One Truss to the International Space Station - Part Two A recounting of the activities aboard the Atlantis and International Space Station during mission days two to eight. October 23 The STS-112 Delivers the S-One Truss to the International Space Station - Part TThree A recounting of the activities aboard the Atlantis and International Space Station during mission days nine to eleven. Also the landing of the Atlantis. October 23 Finding Water On Mars How astronauts might seek out water on Mars. Courtesy NASA. October 30 Constellation-X NASA's plan for a constellation of six xray observatory satellites to try and answer some of cosmology's big questions. Courtesy NASA. October 30 Our Galactic Centre How the Chandra Xray Observatory is revealing the mysteries of our glactic centre. Courtesy NASA. November 6 Planetary Waves Break Ozone Hole How waves in the atmosphere are affecting stratospheric ozone. Courtesy NASA. November 27 Space Station Resupply Mission A description of the activities aboard the International Space Station and the Space Shuttle. December 4 The 2002 Total Eclipse of the Sun in Australia A look at the inside of the Sun and the eclipse of the Sun, which was happening as the programme went to air. (Produced and presented by Alan Walker). December 4 Viewing the Earth from the Intenational Space Station. How astronauts are using a special optical window in the Space Station to get clear images of the Earth, and sending these to Earth via e-mail. Courtesy NASA. December 11 The 2002 December 4 Total Eclipse of the Sun A description of the total eclipse of the Sun as seen from the Stuart Highway, northwest of Woomera. NOTE: This programme was not recorded. We offer here some of the audio inserts used. The recordings were severely affected by wind rumble. December 25 Space Music A miscellany of space music for the festive season. Included Pink Floyd, AstroCapella, Frank Sinatra, Jay Chattaway, The Ventures, Hawkwind, Jimmy Haskell, Vangelis, Shi Lun Li and Christopher Franke.